Designed by Prince Souphanouvong, aka “the Red Prince” and Lao PDR’s first president, the Khoua Ban Darn bridge was built in 1942, spanning the Xe Don river until 1968 when it was destroyed by American bombers attempting to cut off supply lines to the Ho Chi Minh Trail. Browse places to stay in Salavan on Agoda.com. Free cancellation. All that remains of the broken bridge are three concrete columns and one section of the steel structure and we can confirm that as of late 2016, it is in fact still broken. Villagers use a wooden boat to cross between Salavan town and the district of Toumlan. This will only pique the interest of history buffs or those really looking for something to do. Prepare yourself for a bumpy, dusty motorbike ride. 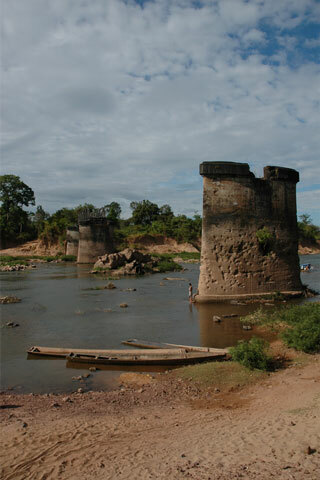 Khoua Ban Darn broken bridge is located 20 km northwest of town. Travel west on the road towards Vapi District and after about 10 km, at Ban Nakhuang village and a sign pointing to the Xe Bang Nouan Protected Area, turn right/head north down the dirt road for 10 kilometres. This road is truly awful. It’s a combination of red dirt, sand and bone jarring sharp golf ball sized rocks. We managed (just barely) to do this by regular motorbike but it is risky as there is hardly any civilisation or infrastructure along the way, nary a village let alone a shop to repair a tire. We noticed a few sections have been graded so there is a possibility that the road may be sealed at some point. As you near the bridge, you’ll pass through a small village with a school and then the road seems to split in two, both seemingly leading to nowhere. Follow the path down to the left to the water. Salavan Tourism has this included on a suggested route they call the “Toumlan Weaving Trail”, a loop that goes up to Koum-ban Toumlan, a Katang weaving village. This itinerary is best for those on off road-type motorcycles who also happen to love weaving and ethnic villages. Last updated on 1st March, 2017. Where are you planning on heading to after Salavan? Here are some spots commonly visited from here, or click here to see a full destination list for Laos.